Before starting to constantly study the tarot, more than 5 years ago, the tarot caught my attention through different channels. First, there was the memory of this old movie I watched as a child, in which a magician was reading the tarot to different persons, to each predicting events that would end in the tragic death of each of the characters. Then, there were several references in some books that I read, such as the Golem. Nevertheless, there were several strong dreams that I had regarding the tarot. Still, I was confused about how to start. It seemed that a lot of people were using it to read the future and to predict dramatic events, but it didn’t feel right to me. It wasn’t until I stumbled upon Alejandro Jodorowsky’s work with which I felt an instant connection and fascination, that I decided to seriously study it and use it. Besides being a film director, actor, comic books writer and therapist, Jodorowsky is also a tarot reader, whom I consider to be my maestro. How can the tarot be used? We are all living in a world in which the real, the virtual, the imaginary and the symbolic are intertwined. Some people are more aware of it than others. For some coincidences and synchronicities are revealing, others ignore them completely. Each of us chooses and is responsible about how she/he lives her/his life, either by unconscious reaction or by aware response. The tarot, composed of 22 major arcane that deal with the essential archetypes and 56 minor arcane that deal with all that is mundane, is a clear mirror of ourselves. When laying down the cards, the arcana never lie, they tell only the truth, showing us in simple but profound and ancient knowledge of the language of the symbols, the things we sometimes don’t like to admit even to ourselves. The tarot can only be used for guidance about the now. The past is over and we continue to re-invent it and re-present it through our memories, the future doesn’t exist yet, but what does exist is the now. We are living only in the now, the eternal moment of now. Whoever uses the tarot to read about the future is a fraud because we have at our disposal thousands of versions of the future, depending on the choices we make every single moment. So actually, somebody pretending to read the future is actually influencing the person who sits in front of him, running the risk of the self-fulfilling prophecy. The tarot works like this. 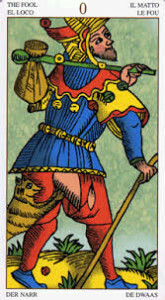 First, one has to be open and receiving and to focus on the question he/she puts, then to set the intention and role of each of the card which is drawn. It is only like this that the card can answer the question, because if we don’t focus when we draw a card, the card will speak to us with a lot of symbols, but we won’t understand anything because there would be too much information. After drawing and revealing the cards, the interaction within them is very important to be observed. Nevertheless, the interaction between the tarot reader and the one who asks for the reading is important, as each of us holds the key to reading the symbols. The symbols are universal and powerful, and although the tarot reader has a lot of experience and uses his or her intuition and feeling about the cards, the one that asks for the reading has his or her own capability to read the images that are presented. So, the reading is always an interaction and it only refers to the specific present moment of the drawing of the cards. Also, I don’t use signifiers or upside-down cards, as I believe that it’s a matter of one’s choice to address the issue positively or not. Each situation, be it a challenge, has a lesson for us, and if we label it as a negative situation, we might run the risk to extend our discomfort and avoid entirely to actually learn the lesson that that situation holds for us. How do you ask for a reading? Not: When will I get married, but: Why don’t I get married? Not: What grade will I take at my exam? but: How prepared am I for this exam? Or What could I do to be more prepared for this exam?